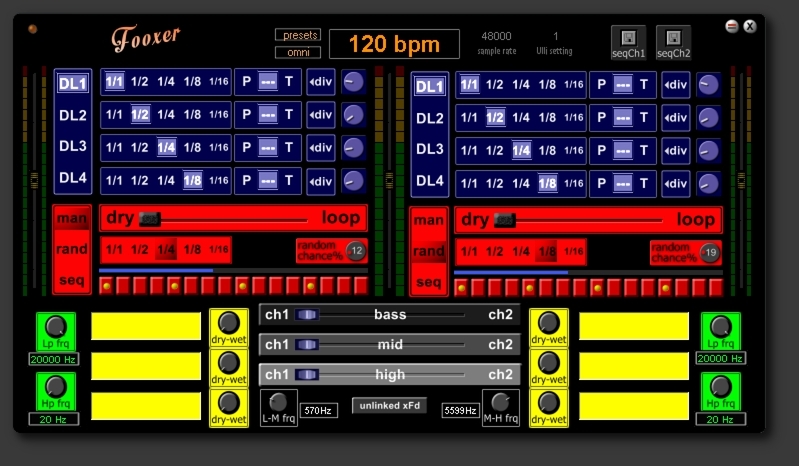 Fooxer: a Loop-mixing device. Mix and loop two stereo signals. 1: input gain and VU. 2: select one of four loop delay lines. 4: select loop delay rhythm - punctuated, straight, triplet. 5: choose Clock Divider or potentiometer delay time. 6: delaytime defined by potentiometer (not synced). 7: master gain and VU. 9: manual loop mode - switch on loop in turning fader to the right. 10:random loop mode - choose when a random loop will probably occur. 11:random loop mode - choose how often a random loop will probably occur. 12:sequenced loop mode - choose steps to be looped. For Ramp retriggering, use midi notes. 13:12dB Lp and Hp filters. 14:three insert Fx with dry/wet crossfade. 17:link/unlink button - if linked, all three crossfaders will react the same. 18:don't forget to set appropriate bmp number. 19:recognized sample rate and Ulli values. If these values don't match, change and then change back to original value. 20:Preset Lists for sequenced loop modes. Installation: if you don't already have it, copy HostStatVCP100.dll to .../App/Dll.